This client had been waiting to start treatment at another clinic for so long that he got fed up, and came to us instead. His teeth were not in good shape, as he had just half his teeth remaining in both the upper and lower jaw, and those that were there didn’t offer much hope. The first thing we did was get his CT scan done within 3 days, and then started his treatment within 2 weeks. It was decided that since his remaining teeth were in poor condition, the best results would be attained by removing his last few teeth and using implants to support full arch bridge work in both upper and lower jaws – i.e. a full set of replacement teeth, of fixed porcelain. Following careful preparation and using the reformatted CT scan data in 3D we were able to ‘virtually’ place all his implants before stepping anywhere near the surgery. Once in surgery, the implant placement was so precise that we were able to immediately place temporary bridges (with 12 teeth on each) over the top of the implants we had just put in the jaw. These temporary bridges were used to tide him over until his new, permanent, made-to-measure replacement teeth were ready. So, following the prior removal of his remaining teeth, this gentleman had walked in with no teeth and walked out with a full set! When the new, made-to-measure teeth were ready we used the implants from the previous session (7 upper and 7 lower) to permanently replace 12 upper teeth and 12 lower teeth. By joining several replacement teeth together to create a stronger overall solution, it is not necessary to use an implant for every tooth we replace: this way we can keep the costs for our patients reasonable without compromising the longevity of the treatment. 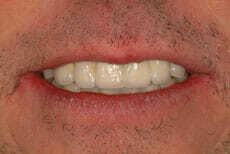 If you don’t mind seeing bare gums close-up, follow this link to see the before and after pictures.